The fighter who calls himself the “Son of God” was kneeling on the canvas. Andre Ward been sent there midway through the second round by a perfect right-hand counter by unbeaten light heavyweight champion Sergey “The Krusher” Kovalev, who retreated to a neutral corner while staring intently at his handiwork. As a Las Vegas crowd of more than 13,310 rose to their feet, so, too, did Ward. As referee Robert Byrd stood in front of Ward and gave him the mandatory eight-count, the “Son of God” smiled. McNabb & Custer talk with Light-Heavyweight Champion of the World Andre Ward about his victory over Sergey Kovalev and whether he wants a rematch. 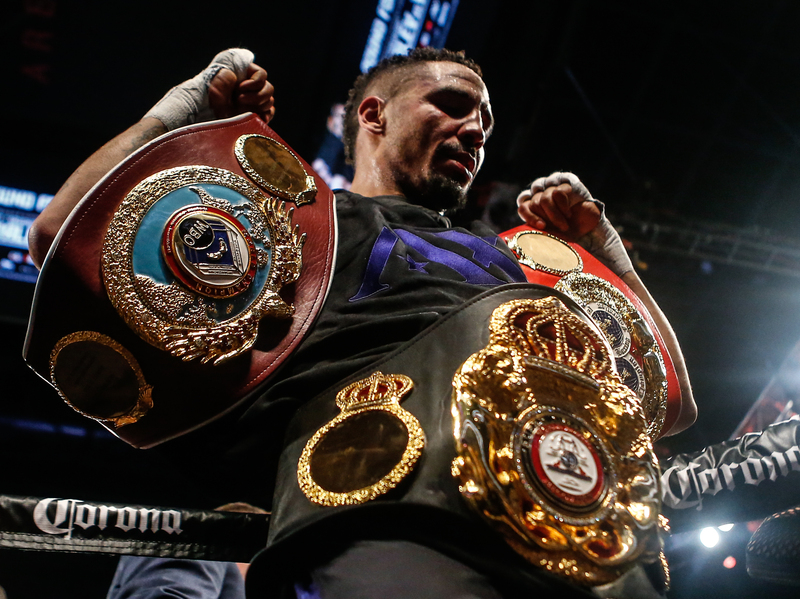 It was only the second time in his career that Ward, one of the world’s best defensive fighters, had been floored. But it was the first time in 11 years and across the ring was a fighter known for his cruel efficiency in finishing off an opponent. As Byrd waved Kovalev in, it appeared that the most eagerly anticipated fight of the year was going to end abruptly. The champion carefully stalked Ward and unleashed a barrage of punches. Ward crouched against the ropes, his hands protecting his face. Kovalev landed a big left hook to the head, shaking Ward and forcing him to clinch desperately. Once freed, Kovalev pressed the action, eager to end the fight. Just before the bell, the Russian landed a 1-2 combination to Ward’s head. The bout’s end seemed certain, a mere formality for a remorseless puncher. 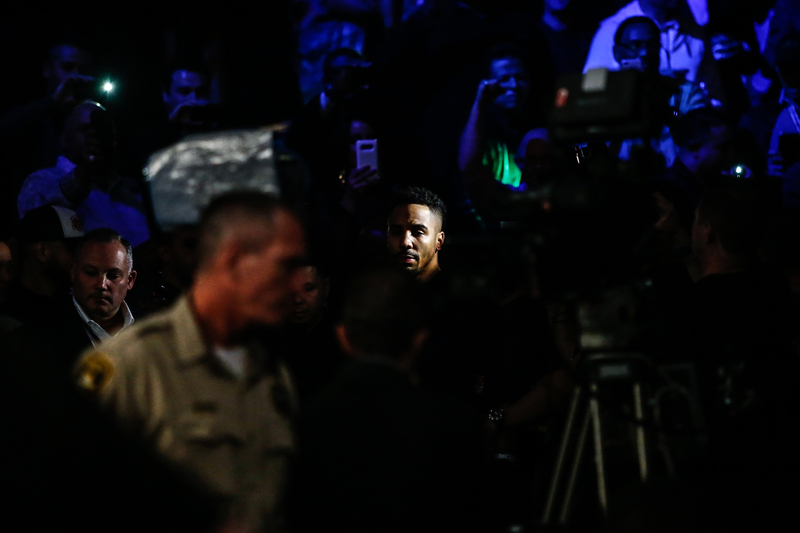 Light Heavyweight boxer Andre Ward walks to the ring as he gets ready to fight opponent Sergey Kovalev for the WBA/WBO/IBF world light heavyweight championship in a twelve-round bout on November 19th at the T-Mobile Arena in Las Vegas. Ward sat on his stool and his corner feverishly went to work. One trainer held an ice pack on his neck, another to the left side of his face, which was already beginning to bruise and swell. Ward’s trainer, Virgil Hunter, who had trained him for more than 20 years, calmly gave his fighter instructions. As Ward rose from his stool for the start of round three, the large video screens over the ring focused on his marked face. While one could clearly see hurt in Ward’s eyes, they also betrayed no fear. Flash knockdown or not, Kovalev came out for the third, looking to end the fight. Ward tried to keep him off with a straight left, but Kovalev forced him against the ropes and started to unload heavy punches. Ward crouched out of danger, grabbed his opponent in a clinch and attempted to maul him against the ropes, gaining time to recover. Byrd warned both fighters for the rough stuff that would mar the fight. Kovalev resumed his assault, scoring solidly to Ward’s body and head, but not with the same effectiveness as the previous round. Ward, however, kept his composure. Clearly respecting his opponent’s power and surprising hand speed, Ward circled Kovalev cautiously, his hands held high. In the last half of the round, Ward began to fire back. He scored with lefts to Kovalev’s head and body, momentarily forcing the Russian to back away. Just before the bell ending the third round, Kovalev landed another solid right counter to Ward’s head, but not with the previous results. Nobody knew it then, but Kovalev’s window of opportunity to impose his will on Ward and win the fight had closed. Kovalev would win the next round, the fourth, putting him ahead by five points with eight more rounds to go. He was dictating the fight, but it would be the last round he would win on the three official scorecards. One of the things that makes Ward such a special fighter is that he’s so cerebral. He catalogs his opponent’s strengths and weaknesses and makes adjustments on the fly. He has mastered both the geometry and the geography of the ring, taking a centimeter here or there, neutralizing an opponent’s punching power or speed or taking advantage of an angle to find an opening for a punch of his own. In previous fights, Ward had made the adjustments quickly and without risk, because he was just so much better than his opponents. Many of his bouts frustrated or bored fans. But against Kovalev, Ward faced an opponent to truly test his mettle, who matched him in overall talent, power and discipline. 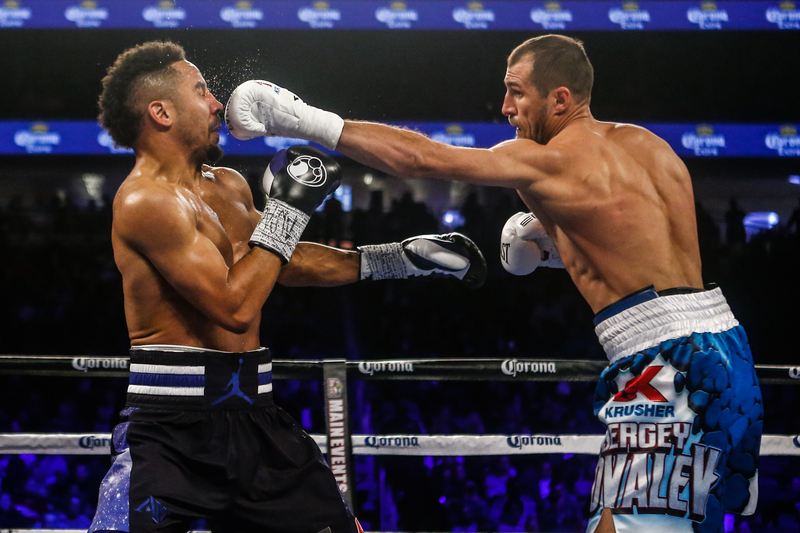 Kovalev continued to dominate Ward on the official scorecards until the seventh round, but it was clear that control of the fight was beginning to shift. 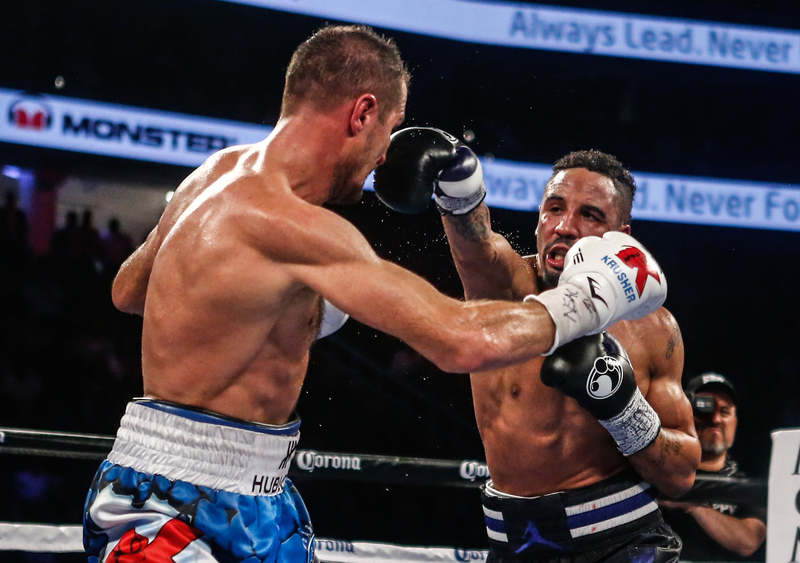 Ward began to solve Kovalev’s aggressive style and it was time to launch a comeback on the scorecards. Just past the midway point in the fight, Ward seized control. The first half of the seventh round was tense, but without fireworks. Few punches were thrown as both fighters circled each other in the center of the ring, trying to feint each other into making a mistake. Then, the tide began to shift. Ward landed a straight left to Kovalev’s head, perhaps his best punch so far. Kovalev pressed forward, only to run into a left-right combination to the head. Light Heavyweight boxers Andre Ward( black trunks) and Sergey Kovalev(blue trunks) fights for the WBA/WBO/IBF world light heavyweight championship in a twelve-round bout on November 19th at the T-Mobile Arena in Las Vegas. Undeterred, the Russian continued to pursue Ward, who sidestepped his opponent. Ward landed two more 1-2 combinations to Kovalev’s head, drawing his biggest cheers from the crowd. Kovalev managed to hurt Ward with a straight left to the head, but took another stiff 1-2 before the round ended. It was the first round that Ward took on all three official cards. He would sweep the next five rounds on the cards of judges John McKaie and Glenn Trowbridge, while taking four of five on the card of judge Burt Clements. One could see Ward’s confidence grow in each succeeding round. He still had a healthy respect for Kovalev’s power. He continued to circle the Russian, but he did not run from him. Ward sidestepped Kovalev, stayed in the center of the ring, or drew him into clinches when he was in danger. In the ninth round, as if sensing the fight was slipping away, Kovalev once again tried to apply even more pressure to Ward, forcing him to the ropes. There were several exchanges, with Ward getting the better of it, scoring to both the body and head. With about 30 seconds left, Kovalev missed with a heavy left hand, thrown so hard that he turned halfway around. Ward avoided the punch, sidestepped his opponent and countered with perhaps his best punch of the fight, a solid straight right hand that stunned Kovalev, knocking a shower of sweat from his head just before the bell. 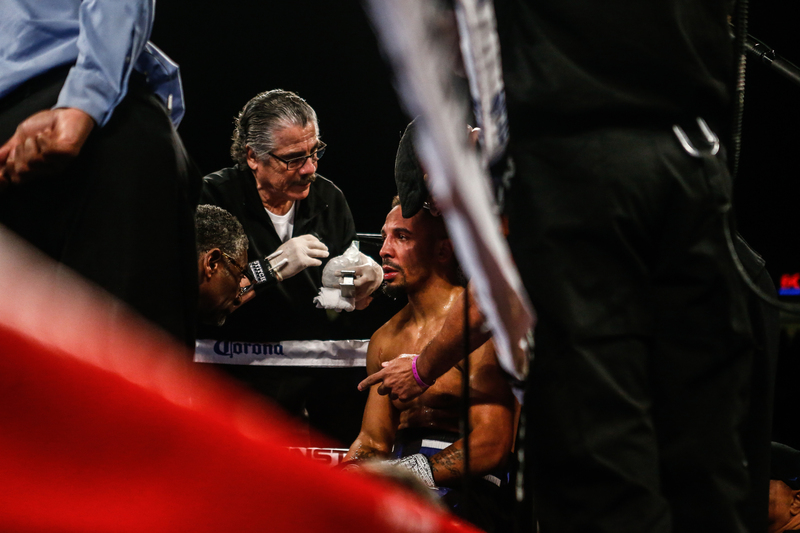 The blow didn’t knock Kovalev down or out, but it affirmed that it was Ward who was now in control of the fight. By the middle of the 10th round, the crowd could sense that the tide had turned. Throaty chants of “S-O-G” and “U-S-A” echoed through the arena, which included a raucous Russian contingent, as Ward attacked Kovalev and avoided most of his punches. For the first time in the fight, the well-conditioned Russian champion appeared tired and frustrated. For the most part, Ward wasn’t winning the rounds by a mile, sometimes by no more than an inch, but he was winning them, nonetheless. While he wasn’t scoring in volume, his punches were more accurate than Kovalev’s. It wasn’t a typical action fight, although there were plenty of hard punches thrown. In some respects, it was an ugly fight, marred by too much clinching and mauling, especially by two such technically proficient fighters. But it was also a thinking man’s fight. Kovalev, the heavy-handed puncher, proved to be a far better boxer than anyone had given him credit for. He was also able to hurt Ward on multiple occasions with his power, especially early in the bout, with straight lefts and rights. But Ward also surprised some with his power, especially inside. Throughout the fight, Ward attacked his lanky opponent’s body, not only scoring points but also slowing his pressure in the critical final rounds of the fight. In the end, Ward had just enough skill, determination and courage to impose his will upon Kovalev and win the fight. In the end, all three judges scored it 114-113 for Ward, on the closest of unanimous decisions. The CompuBox totals for the bout were just as close, with Ward scoring on 116 of 338 punches, landing at a rate of 34 percent. Kovalev landed 10 more blows than his opponent, but threw 474 punches, scoring on 27 percent of them. Savoring the cheers of the raucous crowd, Ward stood in a corner of the ring, the five new championship belts draped over his body. Several angry Russian fans pressed near the ring, booing and flashing obscene gestures at Ward and his entourage. Naturally, in the wake of a fight like this, there was talk of a rematch. Would a sequel between these two evenly matched fighters, these two different styles, be as a compelling as the first bout? Kovalev, classy in defeat, said he would like to fight Ward again. “It’s the wrong decision. I don’t want to say my opinion,” said Kovalev. “The witnesses are here. They saw it. It’s my job. It was a fight of my life. I am disappointed in the judges’ decision. Light Heavyweight boxer Andre Ward with the WBA/WBO/IBF world light heavyweight championship, after defeating opponent Sergey Kovalev by unanimous decision in a twelve-round bout on November 19th at the T-Mobile Arena in Las Vegas. Kovalev, who was defending his crown, earned $2 million for the bout. Ward made $5 million. Both could make considerably more in a rematch. The pay-per-view numbers should provide a handsome payday for both. Without Ward saying a word, his face provided compelling evidence for a return fight. Unlike the unmarked Kovalev, Ward’s handsome face was bruised, knotted, swollen and splotched after the fight, but his was a smiling warrior’s mask. Asked about his future, Ward said after the fight that he wanted to return home to Oakland, California, and relax with his family before plotting out his next step.